Building a go kart is the most satisfying parent/child project I can think of. The smile on a childs face when they drive a go kart for the first time is priceless. We have put together these free go kart plans to help others who want to take on a similar project. 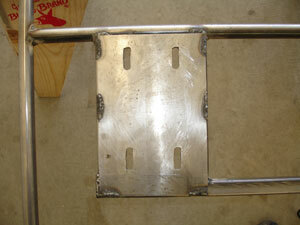 The following is a step by step guide based on the very first go kart we built. There are many things we would do different, however, this information is free so read through it and use any of the ideas you find helpful. Our free go kart plans are the perfect tool for the first timer who needs help taking an idea and putting it all together. These plans are for a very basic go kart that is easy to build. If you have metal working tools that can cut, grind, chop and weld and you have the motivation to take on a project like this, we are confident your kids will be the envy of the neighborhood. The go kart in these plans is a two seater using a 6.5hp engine. We used a solid rear axle which works great for on or off road driving. We also used a simple centrifugal clutch which is easy to install and works great. The seat is adjustable in three positions for children and adult drivers. This go kart is capable of 30mph. The top speed of a go kart is easily adjusted (faster or slower) with a gear change. This go kart has provided our children with many hours of fun and reliable entertainment. You will need wrenches, screw drivers, hammers, a square and all of the basic tools found in most garages. We also used a welder, grinder, chop saw and a powerful drill motor. It's also nice to have a tubing bender, tubing notcher, drill press and any other metal working tool you can get your hands on, however, it isn't necessary to have these special tools to complete the build. We used a combination of square and round tubing. 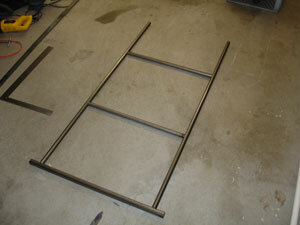 The square tubing is 1" square mild steel with a 1/8" wall thickness. The round tubing has a 1" outside diameter (OD) and a 1/8" wall thickness. This tubing allows for good strength. Careful consideration for the weight of the frame is important because your go kart should be light, not heavy. 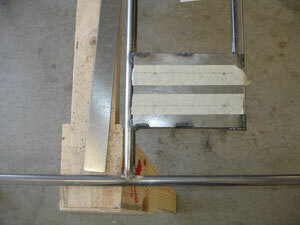 A 24 gauge sheet metal can be used for the floor of the go kart. Many of the parts, such as wheels, tires, pedals, spindles and brake components are from Azusa Engineering, Inc. To find your local Azusa dealer you can contact Azusa directly at (626) 967-4167. You can also find great deals on Azusa parts by searching eBay. The part numbers we reference throughout this website are Azusa part numbers. Start with a chalk drawing on the garage floor. Have the person who will be driving the kart sit on the floor so you can draw your frame ideas around the driver. This is a good time to have some of the parts like the tires, seat, engine and rear axle so you can place them on the garage floor to get a rough idea of their placement. Change your drawing as much as you need until you think you have the alignment and spacing of everything in a good position. Use the dimensions of your chalk drawing to cut some of the frame pieces. Once the pieces are cut, set them on the floor. Have the driver position themselves within the frame and place any parts you have into position like tires, seat, engine and rear axle. 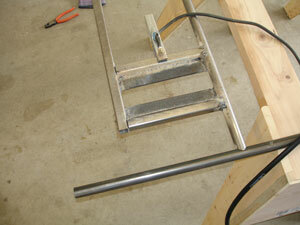 check the spacing and alignment of these parts and make any adjustments to the frame rails as needed.